This DVD comes Free with any Winter Soldier DVD order. 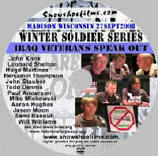 DVD's 27-28 on one disc- McCAIN MIA ON VETERANS ISSUES IVAW MARCHES ON RNC;RAY McGOVERN: WHO STARTED THE WAR IN GEORGIA? & WHO WILL MANIPULATE US INTO WAR WITH IRAN? ; IRAQ UPDATE: Sami Rasouli at Veterans for Peace Conference Minneapolis. DVD 28 IVAW TESTIMONIES MADISON WISCONSIN 27SEPT2008. DVD 31 Free Xtra - CONSCIENCE OF A NATION 30 VETS IN 30 MINUTES. Iraq Veteran Against the War Sergio Kochergin woke up to the criminal nature of the war sometime in his second deployment to Iraq. Speaking out at Winter Soldier Sergio described how he was used and abused. Winter Soldier 2008 Testimonies from Iraq and Afghanistan, Silver Spring Maryland. ‘WE’RE POISONING THE WORLD’: WINTER SOLDIER II Iraq Veterans Against the War (IVAW), Silver Spring Maryland, March 13-16, 2008. Matt Howard (USMC 1st Tank Battalion) reveals the military policy toward its troops: lie and cover-up, then discard and/or discredit. IVAW Winter Soldier Fundraiser - Milwaukee, Wisconsin Feb 23 2008. 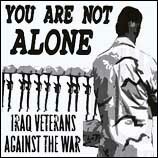 Once again, veterans are fighting for the soul of our country. They demonstrate their patriotism by speaking out with honor and integrity instead of blindly following failed policy. Winter Soldier: Iraq and Afghanistan features testimony from U.S. Veterans who served in those occupations, giving an accurate account of what is really happening day in and day out, on the ground.